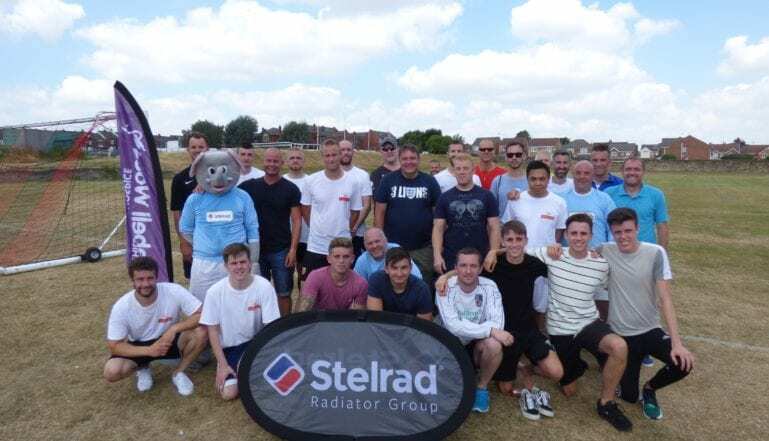 Stelrad Radiator Group from Mexborough – the UK’s leading manufacturer of radiators for the heating sector – recently organised a charity football match for a deserving charity it has been working with for several years – Bluebell Wood Hospice – working in conjunction with the Post Office locally. Lexi Kelly from the company’s marketing team, with the help of workmates Dean Holdsworth in Maintenance and Adam Mars in Production, organised the event for the morning of the day England played Sweden in the World Cup. The game was between Stelrad and the HR services team at Royal Mail, at Mexborough Athletic Football Ground. It ended in a narrow 5-4 victory for the Stelrad team. Bluebell Wood Children’s Hospice supports children and young adults with life-shortening and life-threatening conditions, both in their own homes and at its hospice in North Anston. The hospice supports the whole family, giving them the chance to relax, take a break and make special memories together. There was a bucket collection for spectators on the day, along with a raffle – with bottles and tickets to Sheffield United and Wednesday games and to a Yorkshire Cricket Club match amongst the other prizes on offerIn total £850 was raised on the day and Stelrad kindly agreed to match the funds raised at the event, doubling that total to an impressive £1700. A cheque presentation is being organised for later in the month.